Many of us learned in school that the final comma in a series was not necessary. Still others learned they are absolutely required no matter what. 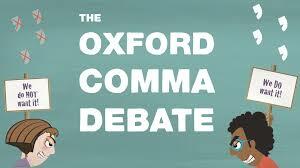 So what is the final, definitive rule for punctuating the elements in a series with the Oxford comma? We sell cheese, crackers, and relish. My favorite pies are apple, cherry, and chocolate cream. In the examples above, there really wouldn’t be any confusion if there were no serial comma. They are all simple, straightforward lists, and the meaning would still be clear without it. To Oxford or not to Oxford? With all the debate over the Oxford, I decided to do a little research and performed a very unscientific survey of fellow grammar nerds, er, I mean teachers, and the response was overwhelmingly in favor of its use. About half the respondents indicated that they mark it as incorrect if it is omitted, and several said they mark it incorrect because the SAT exam counts its absence as incorrect. 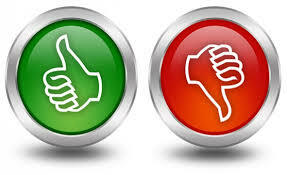 7 recommend including the comma before the conjunction. 2 (Merriam-Webster’s Collegiate Dictionary and Canadian Oxford Dictionary) recommend the comma before the conjunction but acknowledge that some writers omit it. 2 (The AP Stylebook and The Canadian Press Stylebook) leave out the comma before the conjunction unless doing so would cause confusion. The AP Stylebook noted in the final example above, is used by journalists, newspapers, and many magazines who omit it to save space and improve flow. With gratitude to my parents, Mother Teresa and the pope. there is no comma before the final item in this series “the pope,” so this seems to be saying that the writer is thanking his parents, who are Mother Teresa and the pope! With gratitude to my parents, Mother Teresa, and the pope. Now it’s clear that this writer thanks his or her parents, and two other people: Mother Teresa and the pope. This makes more sense! Available side dishes include potato, fries, rice, peas and carrots. How many items do you have to choose from? Four – or five? Are the peas and carrots one combined side dish, or two separate veggie sides? Available side dishes include potato, fries, rice, peas, and carrots. you have five sides to choose from, as the comma communicates that the peas are one item and the carrots are a separate item. I went to see John, an officer and a gentleman. I went to see John, an officer, and a gentleman. I went to see John, who is an officer and who is also a fine gentleman. I went to see John, who is an officer, and another man who was a fine gentleman. The most important thing to remember is that regardless if you are a proponent of the Oxford comma or not, writers should always err on the side of what usage communicates most clearly, and in most cases, using the Oxford wins the debate. The Evaluative Essay: What do you think? If you were considering going to a movie, you might first consider if it’s to your taste. You might read some reviews or ask some friends if they thought the film was action-packed or slow moving, or if it was realistic or too futuristic for you. If your friend told you that the movie you were considering seeing was bad, you would want to know why. Maybe his or her idea of “bad” is that the movie was character-driven, as opposed to action-packed, but maybe you prefer character-driven movies. As you can see, “bad” is totally subjective. You need specifics. How is your friend judging the movie? Does he or she have solid reasons and evidence to back up his or her opinion? Everyone has an opinion, but in evaluative writing, it’s not enough to just present an opinion. The writer has to understand who his or her audience is and know what criteria are important for that specific audience. The judgment acts as a thesis for an evaluative essay. This judgment provides specific reasons based on carefully chosen criteria. The criteria are a set of standards based on your topic and audience. Although the film, The Hobbit, is targeted for children, all audiences can appreciate and enjoy the movie because of its special effects, unique characters, and engaging storyline. This thesis is a judgment (all audiences can appreciate and enjoy the movie) of the movie based on 3 criteria: because it has inventive special effects, unique characters, and engaging storyline. When deciding on the criteria you’ll use to support your judgment, you’ll want to choose criteria which speaks directly to your audience. The criteria in our example, inventive special effects, unique characters, and engaging storyline, was chosen with an audience in mind who are adult movie-goers. Children probably wouldn’t care about all these criteria, nor would people who aren’t interested in movies. If you were to argue that The Hobbit is a bad movie because you don’t like fantasy-adventure tales, that’s more opinion, and the criteria help keep the judgment unbiased and balanced. As you build support for your judgment, you will show evidence, possibly in the form of examples for each reason. Evidence is important, as it establishes credibility with your audience, so presenting a well-thought out judgment and criteria with strong evidence shows you are offering a fair and balanced judgment. In most cases, each body paragraph will present one separate criteria, offering effective evidence in the form of examples from research, or even visual examples. In our movie example, you might use a film shot to illustrate a point. Depending on the requirements of your assignment, you’ll probably need to include research and cite those sources, but if you were writing an evaluation for a blog or magazine, citations won’t generally be necessary, though you should always name sources in a signal phrase. We evaluate every day, whether we think consciously about it or not. We’re always making judgments, and considering how we make those judgments forces us to reason out our opinions. It’s not unusual to discover that perhaps our opinions are built on a flimsy foundation. Evaluative writing forces us to analyze not only what we pass judgment on, but how we pass judgment. For many student writers, deciding on what source material to use in your research paper can be a daunting task. For a longer research paper, the amount of time you’ll spend sifting through source material can feel overwhelming, and then deciding from each source what is important enough to use in your paper is another formidable task. 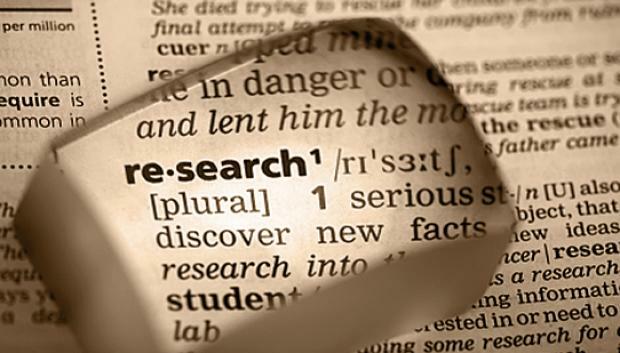 Some sources you’ll find can be useful for providing background or history on your topic. Other sources might support your thesis or illustrate a point. Depending on the differing purposes of how you will use the source material can often guide you in determining if you will directly quote, paraphrase, or summarize the source material. Any type of source material, regardless if you summarize, paraphrase, or directly quote, must be integrated smoothly into your writing. Research that is stuck in to random paragraphs without careful integration with your own voice runs the risk of sounding like it doesn’t belong, creating paragraphs that are choppy and difficult to read, or worse, plagiarized. Writers who aren’t used to utilizing outside sources often have a difficult time making outside research sound like it belongs in their research paper, but with careful preparation, your sources should flow smoothly into your text. According to The St. Martin’s Handbook, direct quotes grab the reader’s attention more effectively than paraphrased information might. You “hear” the information in the original author’s voice, which makes it more compelling than simply a paraphrase. A direct quote also works best if you really want to emphasize the author’s opinion, or if the author is a respected authority on the subject. A paraphrase works well if want to use the details of a passage that needn’t be used in its entirety. You can take the important details, put them in your voice, and avoid including irrelevant or extraneous information. A summary, in contrast to a paraphrase, can be used when you have found a longer passage that has an important main point, but the details are less important for your purposes. The work of writing only begins with the first draft. Natalie Goldberg, in Writing Down the Bones, says that “It is a good idea to wait awhile before you reread your writing” (162). Goldberg stresses, “The writer takes the reader’s hand and guides him through the valley of sorrow and joy without ever having to mention those words” (68). In academic writing, quotes must be smoothly integrated into the surrounding sentences and linked to those ideas. As you include your source material into your paragraphs, consider, what is the connection I need to make? In Death of a Salesman, Willy Loman dreams the wrong dreams and idealized the wrong ideals. “He has lived on his smile and on his hopes, survived from sale to sale, been sustained by the illusion that he has countless friends in his territory, that everything will be all right . . .” (Brown 97). In Death of a Salesman, Willy Loman dreams the wrong dreams and idealized the wrong ideals. His misguided perceptions are well captured by Brown: “He has lived on his smile and on his hopes, survived from sale to sale, been sustained by the illusion that he has countless friends in his territory, that everything will be all right . . .” (Brown 97). In this example, the signal phrase His misguided perceptions are well captured by Brown ends with a colon, as it is a complete sentence. As you learn to integrate sources, you’ll become more familiar with the use of the many different signal verbs. Deciding what signal verb to include in your introductory phrase will be dependent upon how you choose to use it. Do you agree with the source? Disagree? Many different signal verbs are founds in introductory phrases, including the more common says, asserts, claims, describes, disputes, responds, and states. There are numerous signal verbs, and choosing which to use will help you illustrate the author’s opinion as well as your own. When you’ve chose to paraphrase or summarize, you’ll use your own words, structure and style to communicate the source information. Before you paraphrase or summarize, take great care to read the passage carefully and make sure you clearly understand its meaning before you put it into your words. You must prove to your readers that you understand the material. Your reader is relying on you to interpret the information accurately. Nickerson argues that clear communication hinges upon what an audience does and does not know. It is crucial to assume the audience has neither too much nor too little knowledge of the subject, or the communication may be inhibited by either confusion or offense (737). Remember, you must identify the source of any paraphrase or summary, just as a direct quote; even unintentional failure to cite any type of source is a form of plagiarism. As you choose the source material you want to integrate into your paper, keep careful records of where you retrieved the information and any information you’ll need to cite it. It’s much easier and less time consuming to take down all the information as you go than to try and dig it up again and compile it when you’re done. By following a few simple steps as you work to integrate your outside source material, your research will flow naturally and your voice will take center stage, as it should.